Sadly, that was a bit of a disappointment after the slightly flawed but impressively atmospheric build up of the first part. Instead of an homage to 'The Island Of Doctor Moreau' this episode seemed to take a very surreal and cliched journey into 'The Dalek Horror Picture Show' and I was half expecting to see the hybrid Sec break into a rendition of 'Let's Do The Time Warp Again'. Nice spats, shame about the face. And just as I thought I was getting involved in the plot, various story and directing decisions kept lifting me out of the episode. The locked off camera shots of the Daleks gliding about the sewer tunnels, whilst an attempt to give us something different visually and very evocative in part one, rather outstayed their welcome and became visual cliche. They had an artificial quality to them that perhaps underlined the schizophrenia of the episode for me. A kind of bizarre artifice that kept cropping up - the repetitive sequences of the Doctor and the Daleks in confrontation and their continual threat/avoidance to kill him; Solomon's speech to the Dalek ('War Of The Worlds' anyone or was that a nod to the assassination of Martin Luther King?) that seemed like an attempt at Oscar nomination and didn't really have any truth in it as a scene bar for the long awaited extermination; those odd dissolves of the marching human Daleks that tried to convince you an army was on the march; the curing of Laszlo that seemed to happen off screen after the Doctor has stirred up a few phials of something?I just found these choices either bizarre, badly thought out or overambitious. What you expected to happen, did happen, right down to the inevitable 'emergency temporal shift' of Caan at the conclusion of the story. For me it committed the cardinal sin of relying on the 'reset button' mode of storytelling. Tie up all the loose ends in the last ten minutes and bring the overall narrative back to square one as if the events over the last two episodes didn't really have any major effect on any of the characters lives or situations. I don't mind that kind of storytelling as long as it's an engaging and interesting journey back to the beginning. Here we get mass exterminations and genetic experimentation and the Doctor and Martha making a crass joke about 'the pig and the showgirl' as they nip off to pastures new. The ultimate 'Rocky Horror' moment for me was the confrontation in the theatre. All of a sudden, the Daleks arrive on stage, bathed in smoke and bad lighting, and they cease being fascist xenophobes and just look like something out of 'Seven Keys To Doomsday'. All that careful build up in the first part of the story, with the flashes of 'Evil Of The Daleks', just dissipated away by reducing them to vaudeville props. It seemed such a 'small' scene to conclude what was originally something conceived as, and looking like, an epic. And logically it didn't make sense for Caan to order the two Daleks to kill all the slaves and then wait until they're blown up to decide to self-destruct the slaves anyway! The best scenes in the episode were the attack on Hooverville and the 'Frankenstein' laboratory pastiche of the resurrection of the human Daleks. Both were epic, thrilling scenes and visually engaging. The destruction of Hooverville was especially spectacular. The story was also full of good ideas and humour. The two Daleks in the tunnel having a bit of a gossip about the hybrid and looking behind them to see if they're being overheard and the pig guards going up in the lift with their obvious impatience were amusing scenes. The nod to 'Are You Being Served?' with the Doctor's 'first floor - perfumery' quip and Tallulah's 'gammon strike' comment also managed to raise a laugh. What also might have been better dramatically was perhaps to have had the Doctor's attempt to evolve the Daleks be thwarted not by the other Daleks, but by Martha sabotaging the mast (with the best intentions, as she'd be unaware of what was going on and would end up maintaining the Daleks original nature). But instead it fell back into the cliche of the other Daleks putting a spanner in the works which was crudely, if humourously, set up earlier. Freema also got a bit more to get her teeth into this time and to see Martha putting together a plan to electrocute the pig guards (despite being a bit iffy on the science and coming over as a bit of padding) was a great opportunity to show how resourceful the character can be. However, I think it's time the series moved on from the Rose references now and didn't keep resorting to using Martha's unrequited love in the face of the Doctor's emotional fragility as development. It's getting repetitive and isn't moving the dynamic between the characters forward enough. This week, I'm afraid David Tennant turned into the 'shouty' version of the Doctor that I seemed to have trouble with in Series 2. On the occasions where he's here confronting hybrid Sec and/or the Daleks his indignation with them just gets played too broadly which is a shame as in the first three episodes of this year's series he's been pretty much on the mark and has provided a more contained display of anger and righteousness. I'm also slightly troubled by the Doctor's moral position here. In 'Genesis Of The Daleks' he doesn't commit genocide because he realises he'd be just as bad as the Daleks and that a greater good will come from their existence. 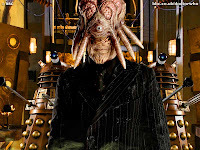 Here, he merrily sides with hybrid Sec to change the entire 'raison d'etre' of the Dalek species without a qualm. A tad naive of him surely? Here, for Sec, oddly it would seem humanity equals goodness but humans are also very capable of evil, destruction and war on a scale with the Daleks. Overall, it looked spectacular but the illogic of some of the plotting, some of the odd directorial choices and an over-repetition of Doctor/Dalek confrontation cliche made it a less effective episode than the first part. Its plunge into surreal 'Rocky Horror' B movie territory, whilst a template that is suitable to the material and its themes of mad science and 1930s Gothic noir, doesn't do any favours to the emotional power needed for the characters to operate in the scale of this story. It felt flat despite all the best efforts.